The Sunroc CSFD5 Water Cooler shall deliver at least 5 GPH of water at 50°F (10C) cooled from 80°F (26.7C) inlet water at 90°F (32.2C) ambient. Bubbler shall have flexible guard, have a non-squirt feature and a lever handle shall activate water flow. Bubbler shall provide smooth steady water flow by means of integral regulator that operates from 20 to 120 psig supply pressure. Evaporator shall be high efficiency tank type and shall be encapsulated in insulation. R-134a refrigeration system shall be hermetically sealed and refrigerant flow shall be capillary tube controlled. An adjustable thermostat having an off position shall control refrigeration system. Stainless steel top shall have an integral drain strainer. Exterior panels shall be powder coated galvanized steel (standard finish) or stainless steel (optional finish). Potable water system components shall comply with the Safe Drinking Water Act Amendments, the 1988 Lead Contamination Control Act and shall be Certified to NSF/ANSI 61, Section 9. 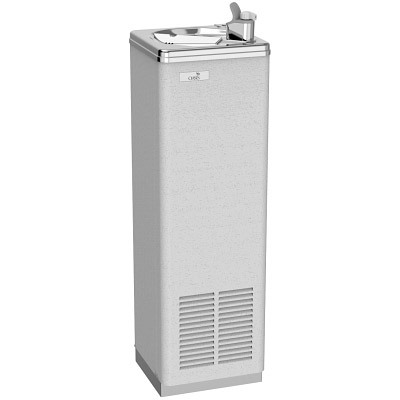 Chilled water capacity shall be rated per ARI Standard 1010. Cooler shall be Listed by Underwriters Laboratories Inc. to U.S. and Canadian safety standards.